The ex-governor was also alleged to have on the same day “received a cash payment of $5,000,000 from Senator Musiliu Obanikoro, the then Minister of State for Defence, which sum exceeded the amount authorised by law and you thereby committed an offence contrary to sections 1 and 16(d) of the Money Laundering (Prohibition) Act, 2011 (as amended) and punishable under Section 16 (2)(b) of the same Act.” At the resumed trial on Monday, Obanikoro, while being led in evidence by the prosecuting counsel for the EFCC, Mr Rotimi Jacobs (SAN), told the court that he helped the then National Security Adviser, Col. Sambo Dasuki (retd. ), deliver N2.2bn to Fayose, adding that the money was from the NSA’s imprest account. READ ALSO: Deceiving Nigerians using ethnicity, religion is bloody nonsense — Buhari Obanikoro said, “In June 2014, I received a call from Mr Peter Ayodele Fayose, when we were approaching the gubernatorial election in Ekiti State wanting to know if there was any message for him from the National Security Adviser, Col. Sambo Dasuki; but I replied no. “Shortly after his call, a message entered from the NSA, saying certain amount of money would be received into the account that was opened for security. The NSA told me that Fayose would call me as to how he would receive the money.” Obanikoro told the court that after confirming the NSA’s message to Fayose, he asked Fayose how he wanted the money to be delivered to him, to which he replied that he wanted a part in naira and the other part in US dollars. Obanikoro said Fayose introduced one Biodun Agbele to him as the person that would help him take delivery of the money, adding that the money was eventually taken in a bullion van to the private wing of the Murtala Mohammed Airport in Ikeja, where Agbele was on hand to take delivery. “I had earlier wanted to transfer the dollars so that the naira equivalent can be withdrawn in Ado Ekiti, which was the reason why I initially called Diamond Bank MD, but he replied that the bank did not have capacity in Ado Ekiti for such a huge amount of money,” Obanikoro noted. 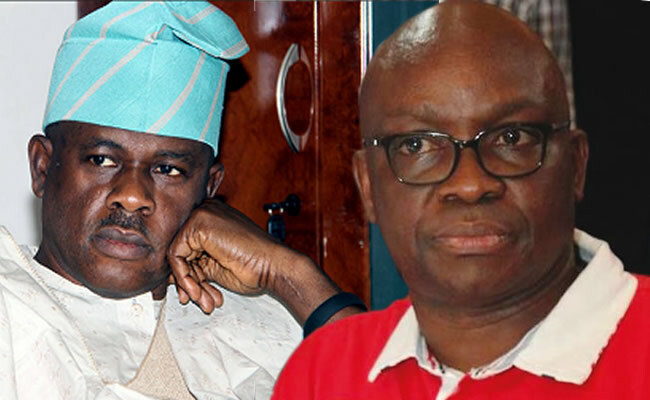 Obanikoro told the court that he later travelled to Ado Ekiti, three days to the 2014 governorship election, where he delivered $5m to Fayose in person at Spotless Hotel, owned by the ex-governor. Asked by the prosecutor to state the source of the money which he delivered to Fayose on behalf of the ex-NSA, Obanikoro said, “The NSA is the only person that can ascertain the source of the money; it is from the imprest account of the NSA.” When asked to explain his connection with the bank account used in taking delivery of the money from the NSA, Obanikoro said it was a security account about which he would not want to divulge much information. Fayose’s lawyer, Chief Kanu Agabi (SAN), sought an adjournment to cross-examine Obanikoro, consequent upon which Justice Mojisola Olatoregun adjourned the case till February 4. As part of the charges, the EFCC accused Fayose of “using an aggregate sum of N1,151,711,573 to acquire chalets 3 and 4; and 5 and 9 of the property at Plot 100, Tiamiyu Savage Street, Victoria Island, Lagos in the name of JJ Technical Service.” Fayose was equally accused of purchasing a property at Plot 1504, Yedsema Street, Maitama, Abuja for N270m from one Rabi Kundili. The former governor was also alleged to have purchased another property at No 44, Osun Crescent, Maitama, Abuja for N200m in the name of his elder sister, Moji Oladeji. He pleaded not guilty alongside his company, Spotless Limited.